This is another way to automate the brewing process. All ingredients (except water) are packed in a leak-proof capsule. Now, the number of ingredients, grind, and taste and freshness, are the manufacturer’s business. Single serve coffee makers are designed to brew hot drinks in a quick and simple way. All you need to do is buy capsules and push a button from time to time. Please, pay attention to the type of capsule. Only one brand of capsules is tailored for such individual coffee makers, and they do not match other models. However, some devices can use aftermarket capsules. In coffee maker single serve, capsules differ in both taste and type: apart from espresso, manufacturers offer cappuccino, tea, cocoa, etc. Prices vary too. It would be ideal to taste drinks brewed in different devices featuring different types of capsules and make your choice. If you want only 2-3 cups of cappuccino each day, please, look for a single serve cappuccino coffee machine. There are affordable models that cook coffee and milk-based drinks and pour them in capsules in just two presses of a button. Dolce Gusto uses dry milk, Tassimo – sterile concentrates. Both devices use two capsules consecutively (first the espresso capsule and then the milk capsule). Milk-based drinks from single serve appliances are inferior to those produced by automatic coffee makers featuring milk frothers. Nespresso machines make milk-based drinks in the same way as automatic bean-to-cup machines do or with the help of a standalone aeroccino frother. However, these systems are quite expensive. 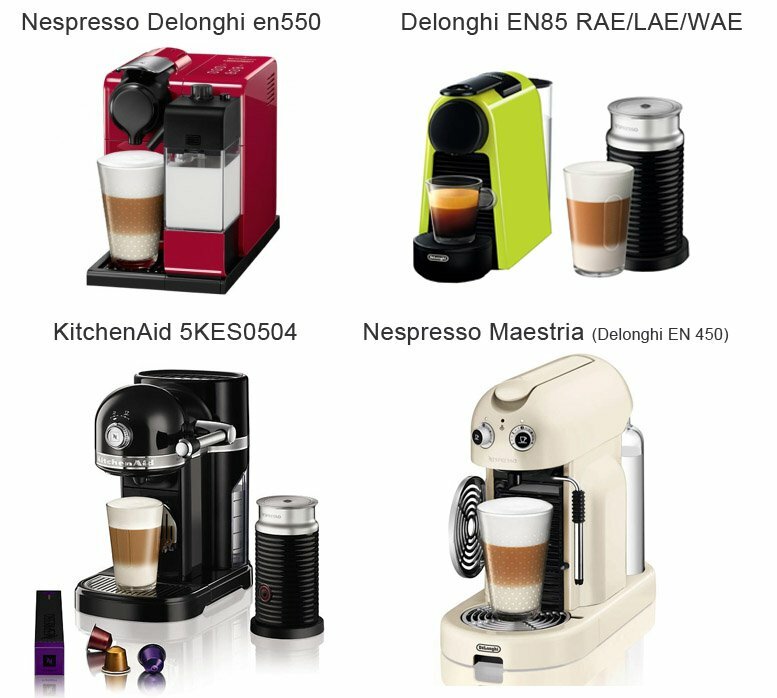 ­­Here are a few examples of capsule appliances: Nespresso Delonghi en550 with a milk carafe; Delonghi EN85 RAE/LAE/WAE with an aeroccino or KitchenAid 5KES0504 – a premium one. There are downright rare capsule coffee makers featuring a hand-driven panarello milk frother – Nespresso Maestria (Delonghi EN 450). Prices differ greatly depending on the manufacturer and functionality. There are lots of affordable coffee makers. However, there are devices that can satisfy those who want a good thing right here and right now. Assembly, appearance, and size: modern single-serve brewers are designed to take up less space in your kitchen or office. Most of them have plastic bodies. There are various designs, and, traditionally, DeLonghi take the lead in good looks. Krups, Keurig, and Paulig boast some exquisite pieces too. In a single serve device, a milk frother is an optional element. It can be manual or automatic (a milk supply system). A milk frother can make a thick layer of crema or latte out of pure milk, not milk powder. Although automatic milk frothers to the job very well, they add pretty much of workload in terms of care and maintenance. Basically, it implies filling the canister with water and emptying the container for used capsules. Also, you have to empty and rinse the drip tray and the grid under running water. If your single serve device features an automatic milk frother, you are going to have to check your milk’ freshness and clean the frother’s every little part. Generally, all single serve coffee makers are believed to use original capsules. This is what user manuals say. However, there are cheap capsules, which are compatible with some devices. You’d better check if that is the case with the device, which you are going to buy. Used capsules are removed and disposed of, so you do not have to clean the brewing unit. Simple maintenance. Easy to clean. Capsules match only certain brands of coffee makers: there are compatibility issues.